I am glad it's Friday. This week seemed to drag by. Although, the highlight of my week was the Sacramento Kings game last night. The Kings lost, but they played the Spurs, so Eva Longoria was there. She looked gorgeous and clapped almost every time her fiance, the Spurs' Tony Parker, touched the ball. It's always fun to star-watch when your team is losing. 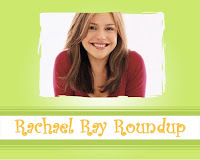 The blogosphere went nuts this week about Rachael Ray. Almost every blog post was about either her dog encounter in Central Park or her Dunkin' Donuts deal. Since we already covered those topics this week, I excluded most of those posts from the Roundup. If you write a post about Rachael or see one that you think would be good for the Roundup, please e-mail me. Tracy at Kitchen Spark tried Buffalo Popcorn Chicken Bites and has some tips on how to make them. Cate at Sweetnicks tried Rachael Ray's recipes for Cheese and Caramelized Onion Pizza and Carbonara Pizza. The former was OMG good and the latter was just good. She also tried Roasted Chicken with Potatoes and Dijon Asparagus. Both were winners. Mimi at French Kitchen in America considers why Rachael Ray becomes a target of so many people. Make sure to check out the comments on the post, too. China at The Modernista tries to figure out Rachael Ray's secret. I think she's right - it's all those veggies. I know my vegetable consumption quadrupled when I starting making her recipes. Kimber at No Limit Ladies discusses the appearance of Carmen Wong Ulrich on Rachael's talk show. Ulrich is the author of Generation Debt and a former editor at Money magazine. Mike at TV Food Fan shares what Rachael Ray and the Phillie Phanatic have in common. The Celebrity Baby Blog discusses Rachael's comments when she appeared on The View about having children. Jacob at Food Network Addict has more coverage of the South Beach Wine and Food Festival, including details and pictures from Rachael Ray's cooking demo. Teamsugar is asking how your favorite Food Network star is. Hmmmm, who should I vote for? They also tried out Rachael's Thai Chicken Pizza. Martha at Martha Cooks tried the Smokin' Joe Robinson from Rachael's Open House Cookbook and is looking forward to making more recipes from the cookbook. Yeah, the RR Haters do that. I agree with you - I think she's being very self aware with her stance on having kids. Why do they hate her? Sheer jealousy? She's got what a lot of us do not have looks, personality, fame and fortune. Oh, that must stick in a lot of craws. Maybe it's not that simple, I dunno. But she sure evokes a lot of hatred, it seems. I have to be in the right mood for her, and I just watched one of her shows beginning to end for the first time last weekend. Funny thing, I bought one of her cookbooks for a shower gift, found it had flaws, set it aside and looked at it today for the first time. I did not see a whole lot of convenience foods in the recipe ingredients. Mimi - I stopped trying to understand why. I just don't get it and I'm kinda glad that I don't! I guess there simply is no raqtional explanation for some people's anger. I should point out that when I said the cookbook had flaws, it was some pages turned upside down. I did not mean to imply the recipes were flawed. Ahhh, gotcha. The pages are all right side up in my versions. She had about a million cookbooks come out last year. Maybe with less this year (2, I think) there won't be as many mistakes like that. I believe teh choice to have or not have kids is personal. And who is anyone to judge. I can't believe it's 2007 and people still ask people these types of question. I chose not to have children and it seems like I always have to give reasons to some people. We should ask some people, "why DID YOU have children?" LOL. Anony - for some reason, people get really worked up about it. I don't get it!